The night's busting open, these two lanes will take us anywhere. 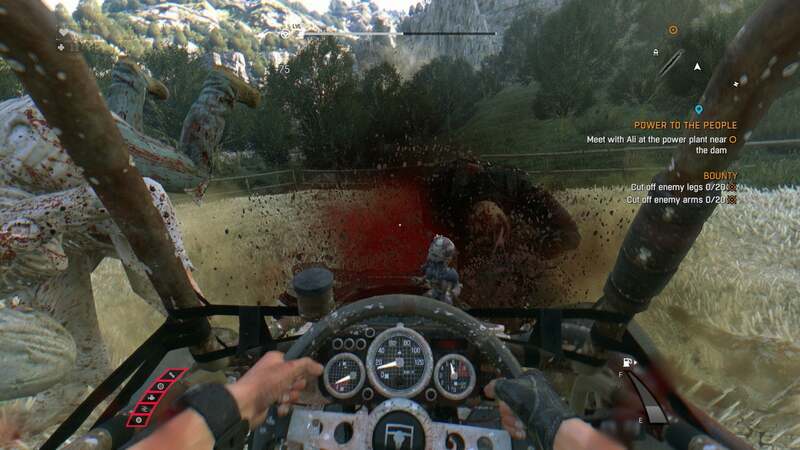 Note: This review contains spoilers for the original Dying Light. Read at your own peril. When last we left Dying Light [SERIOUSLY, SPOILERS], bland-everyman-hero-guy Kyle Crane had leaped across hundreds of rooftops, hacked apart thousands of zombies, and finally thrown mercenary villain Kadir “Rais” Suleiman off the top of a skyscraper. Abandoning his paramilitary outfit, Crane vowed to stay in Harran and help the survivors. And then he probably looted Rais’s skull to make a coffee mug or something. Anyway, what’s done is done. The new Dying Light expansion, The Following, picks up sometime later (presumably). And this time, you’re moving to the country. The Following is its own self-contained bit of content, accessed on the Main Menu by trying to start a new game. 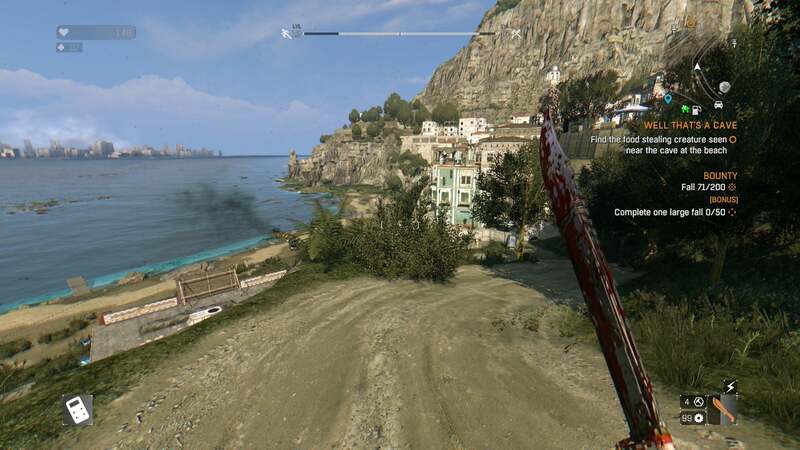 Don’t worry—you won’t overwrite your proper Dying Light save. It’s there if you want to go back. But you can’t warp directly between The Following and the original game. You can, however, import your very own Kyle Crane, though Techland recommends you hit Level 19 before transitioning over. Crane is chasing a rumor: That outside Harran, there are people who are immune to the infection. Tale as old as time. No, they won’t let you see The Mother. When you show up, nobody will even speak to you. You have to earn their trust by doing odd-jobs for members of the community, working your way up the well-trod ladder from stranger to beloved henchman until The Mother’s servants, the Faceless Ones, see fit to call on you. It’s a familiar set-up: Go here, do a thing, come back. Fetch quests, far as the eye can see. The Following tells a more intriguing (albeit more ridiculous) story than Dying Light, but it follows the same tedious structure as before and I’m still not thrilled. Much of your time is spent traversing the environment, and a lot of the secondary or tertiary missions are indistinguishable from each other. But the dune buggy. The dune buggy saves it. With Crane abandoning the cities for amber waves of grain, Dying Light essentially abandons an entire aspect of its identity: The parkour. It’s still there, sure. But—surprise!—farms don’t have much for Crane to jump over. You can climb some boulders, or maybe scale a bus, but your main mode of transportation in The Following is a fancied-up go-kart. 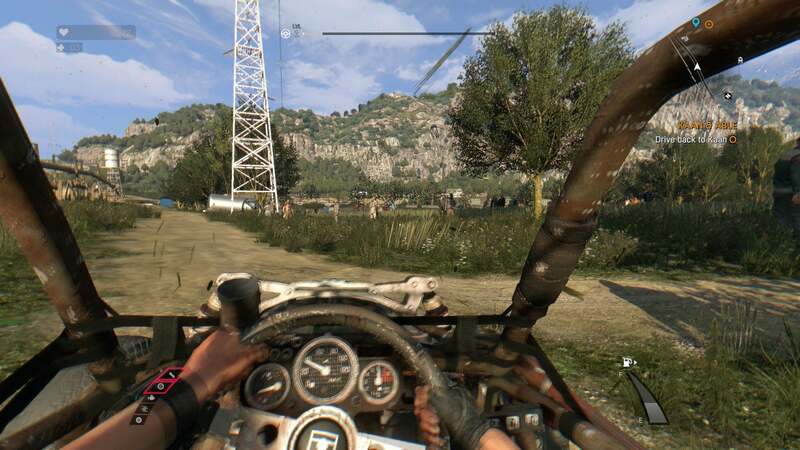 The buggy comes with its own Driving skill tree, which turns your puttering diesel-eater into a zombie killing machine. Run over zombies. Then run over more zombies. Then run over every zombie. That seems to be the key to The Following. It’s fun. I initially held back from using the buggy, nervous because it eventually breaks down in the same manner as your weapons. Five different components take wear-and-tear damage as you drive, and your fuel gauge gradually depletes. You’ll need to scavenge parts and fuel from abandoned cars, and that seemed like a chore when I began playing. So I walked/ran/grappling hooked. And credit to Techland: In different hands, I’ve no doubt this “expansion” would’ve been called Dying Light 2. In fact, I’m surprised it didn’t get full-blown sequel status. It’s certainly big enough. Literally: Big. Massive, even. 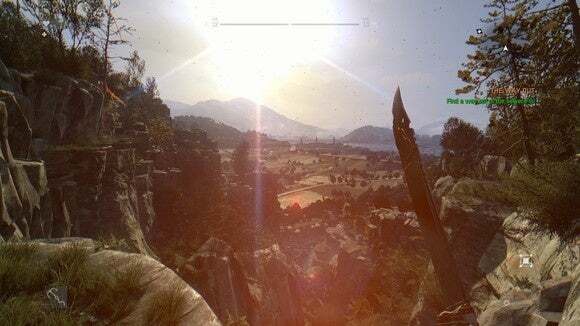 Running across the map is tedious, and for good reason—Techland’s become fond of boasting that The Following takes place in “a region the size of all Dying Light maps combined.” I’m not willing to verify that claim, but it feels truthful. The two aren’t truly comparable, regardless. Dying Light proper managed to feel bigger than it was because it mostly consisted of winding streets and hidden interiors. The Following is the opposite—empty stretches, punctuated by the odd highway overpass or farmhouse. But once you get into your silly little car, those long stretches of nothing take on a different character. You discover the countryside is actually curved roads and fences to plow over and stupid “Who built this, anyway?” jump ramps and tight turns and fields full of zombies waiting to be run down. It’s the unholy lovechild of Dukes of Hazzard and Death Race 2000. All that’s missing is Kyle Crane whooping as he runs over yet another undead Harran farmer, beer in hand. Kyle Crane doesn’t whoop. Kyle Crane is too boring to whoop. The point is: The buggy makes a difference. It seems like a gimmick, but it makes Dying Light’s fetch questiness just a little more tolerable. You may still pull open your map and groan when you see that the next mission is located on the far side of the map, but gun the engine and indulge yourself a bit. Put a ramming bar on the front of your buggy, drive through the fields, and play bowling with a horde of zombies. If a zombie jumps on your vehicle, punch it in the face. It’s perversely satisfying. If Dying Light was Far Cry 3 with zombies, then The Following is its Blood Dragon-esque spin-off. It’s never quite as silly as Blood Dragon’s neon-soaked cartoon world, but definitely less self-serious, less punishing, more prone to mindless power fantasies. The fetch quests need to go. Or they need to be dressed up better. Either way. 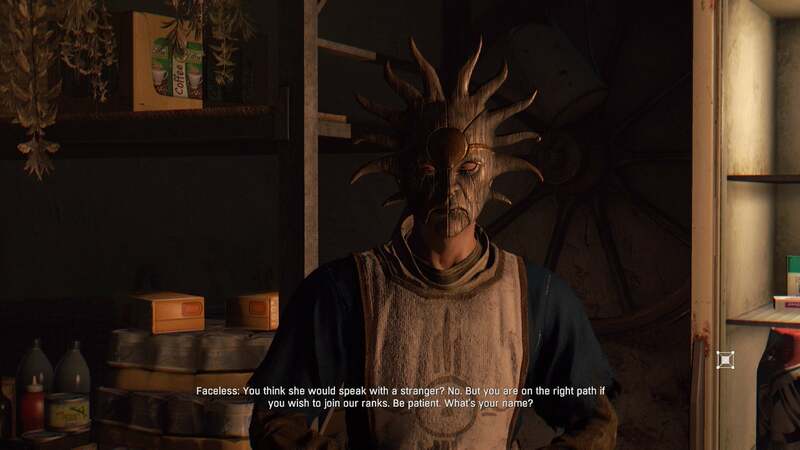 I thought Dying Light was over-reliant on them in its first incarnation, and that was in a pre-Witcher 3 world. Playing The Following, I often found myself pulling open the map, looking at how far I needed to go to reach any objectives, and simply quitting for the night. Not a great feeling. But for all its flaws, Dying Light is still a hell of a sandbox—an incredible set of mechanics in need of a better story. The Following’s is-it-supernatural-or-isn’t-it shenanigans take Techland one step closer. Hopefully a proper Dying Light 2 will ditch the gofer contrivances for something a bit more creative. Regardless, at $20 this expansion is a steal. This massive expansion refines Dying Light's yummy formula, though it still suffers from some of the main game's faults. And at just $20, it's a steal.